Photographs showing the kiosks of Walking Picture camera operators give us a glimpse of the operations behind the images. This is a firm new to me, Guy’s Snaps. They operated in Weymouth, taking pictures of tourists arriving in the large coach park at the west side of Radipole Lake. A miniature railway terminus opened here in the late 1940s which boosted picture opportunities (and Chipperfields later opened a permanent site close by). It is estimated that the railway carried 100,000 passengers during the four month holiday season in 1950 (it closed at the end of the sixties). 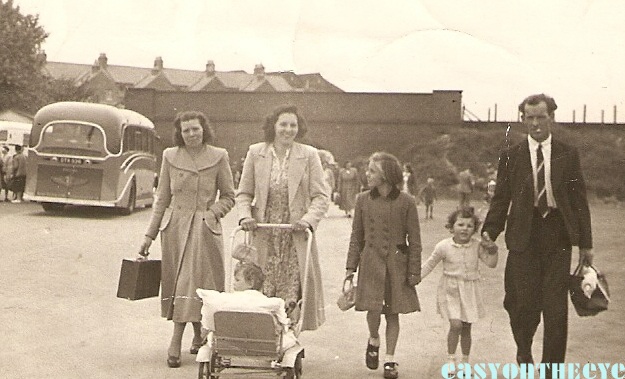 Just off the coach in the photograph (and snapped standing still) are the Farthing family; mum carrying the suitcase (it looks like she’s already bought a postcard to send home! 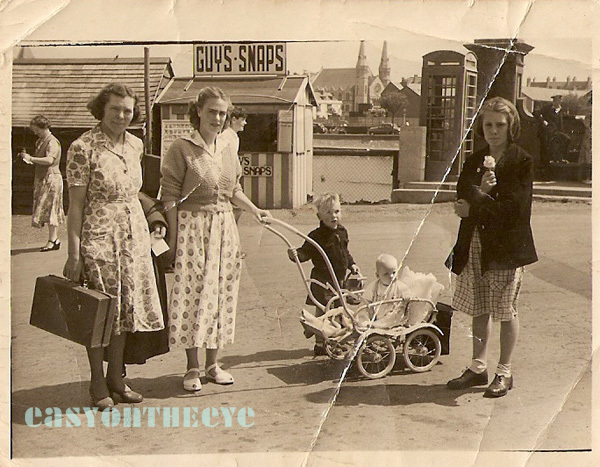 ), married daughter Rona with her two young children (Mark clutching the regulation tin bucket and spade), and mum’s youngest daughter Gill on the right – keeping her ice-cream safe. Guy’s kiosk has a display board with earlier snaps lined up for viewing. 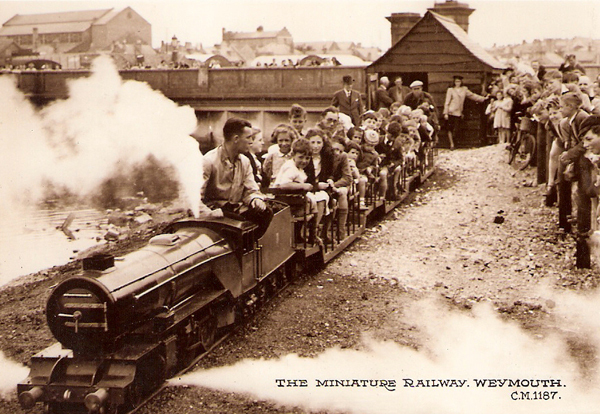 The wooden roofed shed next to Guy’s is the ticket office for the miniature railway (which you can see in the commercial postcard view of the train). The big stone pillar behind Gill is the corner of the Westham Road bridge which forms the boundary between the lake and the marina. Amazingly it is just about the only thing which remains today, Weymouth having demolished and redeveloped large areas of the town (and still flattening character buildings even today). Even the church seems to have gone. It was Gill who kindly let me borrow the photograph (along with the walkie above of her and family taken in the same coach car-park). It was only after scanning it that I noticed the woman in the background on the left, who does seem to be holding a camera. I have recently been contacted by her daughter, who says this is Lillian Guy, wife of Henry Guy, at work. Thanks to Gill for the photos, and to http://www.worldrailfans.info for the information on the railway. Loved seeing this. I live in New Zealand but my family photo album has similar black & white pics from my childhood. Do feel free to submit them Val!